REDWOOD CITY, Calif. – April 6, 2010 – From the hit videogame to the street, Need for Speed™ is the nerve center of gaming car culture. Electronic Arts Inc (NASDAQ: ERTS) today announced an entertainment program that brings together the top street, drift, GT racing, time attack cars and drivers. Dubbed ‘Team Need for Speed’, these individuals embody the spirit of the Need for Speed franchise – the adrenaline and rebelliousness of driving the world’s coolest cars. Together, this collective of racing influencers will carry the Need for Speed brand into a variety of events, films, competitions and more. Team Need for Speed consists of an all-star roster of drivers renowned for their skill on the track and passion for the automotive lifestyle including Vaughn Gittin Jr. (Drift/USA), Matt Powers (Drift/USA), Edward Sandström (GT Racing/Europe), Patrick Söderlund (GT Racing/Europe) and Mad Mike Whiddett (Drift/USA, New Zealand, Japan). Additional drivers will be announced in the future. The season kicks off this week as three of the Team Need for Speed drivers hit the track. On April 9, Mad Mike Whiddett and Matt Powers compete in the ‘Streets of Long Beach’ Formula D event and on April 10, Patrick Soderlund and teammate Edward Sandström will compete in the VLN Series’ Stunden-Rennen race at the Nurburgring Nordschleife in Germany. The Team Need for Speed program also features a 12-part film series about the Team Need for Speed drivers and their cars directed by renowned automotive filmmaker, Will Roegge. Need for Speed is also expanding its Formula D sponsorship with the Need for Speed Lounge where attendees can meet the drivers, Mad Mike Whiddett and Matt Powers, and play the latest Need for Speed games. With over 100M units sold, Need for Speed is the best-selling racing game franchise in the world and is known for delivering unparalleled white-knuckle racing, creative customization and street style. Last fall EA published Need for Speed SHIFT, the highest rated Need for Speed game in years, featuring an intense first-person crash dynamic and a signature cockpit view that delivers a true driver’s experience. Need for Speed World is a massively multiplayer online action racing game that is currently in the beta process and will be available this summer on the PC. For more information on Team Need for Speed visit needforspeed.com, become a fan at http://www.facebook.com/needforspeed or follow us on Twitter at NeedforSpeed. Press can download assets at http://info.ea.com. 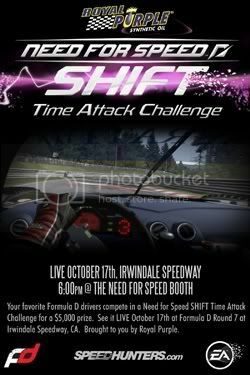 Long Beach, Calif. – October 12, 2009 – Formula DRIFT will be hosting, during the Round 7: Judgment Day season finale, a live video game competition between the top drivers of the series in the Royal Purple – Need for Speed Time Attack Challenge. The drivers will compete using the newly released Need for Speed SHIFT game and the winner will receive a check for $5000 courtesy of Royal Purple. Invites have been sent out to the top Formula DRIFT drivers to compete in this challenge. The drivers will need to qualify on Thursday, October 15 to make it to the live competition during the Round 7: Judgment Day event. The top 3 qualifiers will then compete during half time between the Top 32 and Top 16 Pro Competition at the Need for Speed SHIFT booth. Only one driver will be crowned the winner and will receive a $5000 check during the podium ceremony from Royal Purple. The final competition will see the top 3 qualifiers battling on an XBOX 360 console in a hot lap challenge, with the fastest driver being awarded with the win. The drivers will be piloting a Maserati MC12 on the Nurburgring Nordeschleife track in Time Attack mode. Tickets for Round 7: Judgment Day on October 16-17 are available now. Online tickets can be purchased on the Formula DRIFT website. For more information, visit: www.formuladrift.com. Speedhunters.com has just uploaded a new video titled, “The Story So Far,” as part of their new Speedhunters Mediascape style of videos. 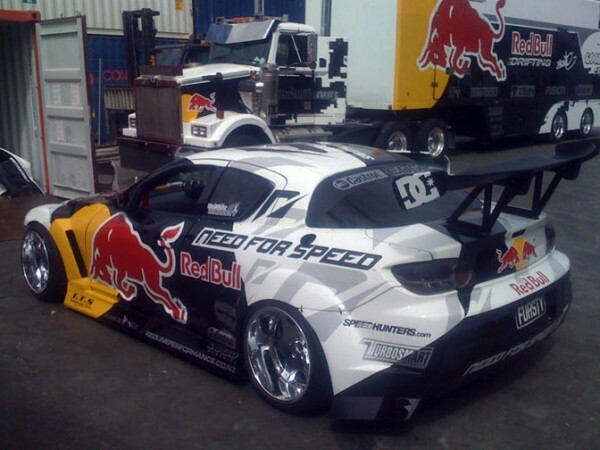 This video chronicles The Story So Far from rounds 1-3 of Formula Drift 2009. Great job by the SpeedHunters team. Be sure to sign-up for Formula DRIFT All Access for more great videos on FDTV, image galleries, and the new Miss FD fan page. This footage was taken at this past year at Irwindale 2008. Here’s a point of view from Michelle Cifuentes one of the Need for Speed Girls, as she watches the qualifying session! Also check out Speedhunters website! They have some really cool interesting articles! !